Many people today are choosing to grow their own food. There are numerous good reasons why you should do it as well. Truth is that today food is cultivated by using some methods that can significantly reduce the nutritional value of the foods. Not just that, but some techniques for cultivating can even make the food dangerous for your health. Some plants are sprayed with different harmful chemicals like herbicides or pesticides. Food also has to travel very long distances until it reaches its final destination in the supermarkets. All of that can make the food less nutritious. Our planet also suffers because of the fuel and energy used for transporting and storing the food. Therefore, people started looking for effective solutions for cultivating food in the place of their residence. One such solution is the so-called window farm. 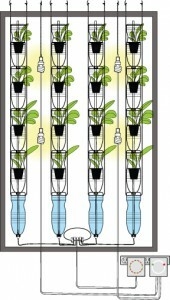 A window farm is a hydroponic type of farming, created vertically and designed to function year-round. You can grow foods indoors on your windows. It requires some intervention from you as a farmer, and this farming system enables you to easily grow your plants hydroponically even if you live in a very limited space and during all weather seasons. The main goal behind window farming is to encourage urban people to grow their own food inside their homes throughout the entire year. That way people can significantly improve their quality of life and live healthier. So how exactly this system works? The water pump is connected to a timer, and this pump circulates the nutrients through the columns of plants. Water goes from the bottom water reservoir up to the top plant bottle through a lift system that is powered by an air pump. Water then goes down from one bottle to another, goes through the hairy roots of the plants and if there are any unabsorbed nutrients they are collected again and the water goes straight down to the bottle of the bottom reservoir. The hydroponic system means that the water filled with nutrients is pumped from the base reservoir and goes from bottle to bottle, making all roots of the plants wet along the way. Water that has not been absorbed collects again inside the reservoir and is later pumped again. Usually plants that grow in soil have roots that go deep and wide, but plants that are grown hydroponically have dense and hairy roots. The roots here are very compact and do not take much space, which makes this system very efficient to use. There are many different things that you can grow in a window farm. In fact, you can grow all types of plants, except for root vegetables like radishes, carrots or parsnips. Try window farming and you will quickly see all the benefits it brings. It makes for an awesome background in a selfie post for selfie swiper. It’s very trendy! Not only you will learn good farming techniques, but you will also enjoy eating healthier and more nutritious food. Window farming will not take much of your time, but you will still have good foods to eat all year long.